Searching for easy and delicious chicken breast recipes? Boneless, skinless chicken breasts are one of the most convenient meats available in your supermarket. These easy crock pot chicken recipes make chicken that is tender and juicy. The added ingredients are easy to find pantry staples. As an added bonus, kids love chicken! And be sure to look at Chicken - Quicker! for more super easy chicken breast recipes. Each of these quick and easy chicken recipes stands on its own, but use your imagination! Slice or chop any of the coated chicken recipes and place on top of mixed lettuces with avocado and your favorite dressing for a quick main dish salad. Or toss Parmesan Chicken with some spaghetti, olive oil and chopped tomatoes for a delicious quick pasta main dish recipe. This fabulous five ingredient recipe tastes like something from a fancy restaurant. 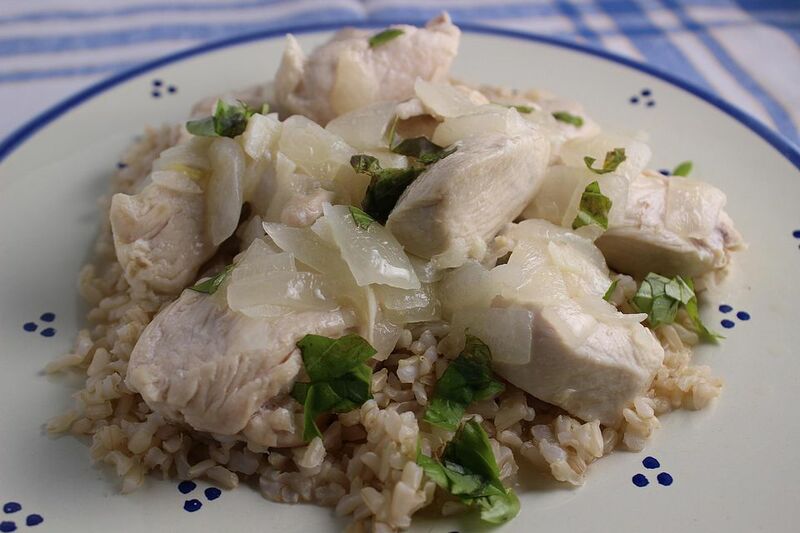 Lemon and garlic flavor tender chicken; serve a rice pilaf. Cornmeal, Parmesan cheese, and herbs make a deliciously crispy crust on chicken cooked on the indoor grill. Just three ingredients, plus chicken, make this baked recipe super easy. And quick. Yes, you can get the flavor and crunch of fried chicken even when baking boneless, skinless chicken breasts in the oven. You could make just the delicious chicken recipe if you'd like - bake them at 375 F for 20 to 30 minutes until the chicken reaches 165 degrees F.
Chicken breasts bake to juicy perfection in this simple and elegant recipe. It's special enough for company, but easy enough for an everyday meal. Sour cream and garlic coat chicken breasts, then they're rolled in a cornflake, bread crumb, and cheese mixture. This recipe for baked chicken breasts is very flavorful. This collection of coatings for boneless, skinless chicken breasts runs the gamut from hot and spicy to soft and cheesy. Take your pick! Bacon and chicken are natural partners. This easy chicken recipe will be a huge hit with your kids. Spinach and chicken in a creamy sauce over fettuccine makes a lovely dish that's special enough for company. This super simple five ingredient sauce is brushed onto chicken breasts, then grilled to glazed perfection. You could use this recipe with peach jam and peaches, or strawberry jam and chopped strawberries too. Food safety is one of my big concerns, so here are some tips that are especially important to follow with raw meat in your kitchen. Store raw chicken in the coldest part of the fridge for no more than two days, and make sure you don't put it on top of other foods that won't be cooked before eating. Raw chicken juices dripping onto lettuce or fresh fruits is a real no-no. Cook chicken thoroughly and don't let it sit out at room temperature for more than two hours. Feel free to substitute, add or subtract any ingredient that your family likes or doesn't like. Substitute crushed crisp rice cereal for cornflakes. Use walnuts or cashews instead of pecans. Change the seasoning completely - or leave it out if that's what your children prefer! One tip - when you tweak a recipe and your family loves it, make sure to write down your changes. Many a time a good recipe has been lost because the cook failed to make note of additions or substitutions. As Laurie Colwin said 'those recipes are like lost chords of music'. Have fun experimenting with versatile chicken breasts, and you'll realize the possibilities for new recipes are endless!